A simple burger stacked with flavor and toppings! Heat grill to a medium/high temperature. Heat 1 tablespoon of vegetable oil in a saute pan and saute mushrooms for 2-3 minutes. Set aside. Fry bacon to desired doneness, about 5 minutes on each side. Set aside. Bake 8 onion rings according to packaging instructions. Set aside. Grill burgers 5-7 minutes each side until desired doneness. Place 2 slices of cheese on top of each burger and continue to grill until melted. Remove from heat. Mix together mayonnaise, hot sauce, mustard, salt and pepper and spread on both sides of the buns to taste. 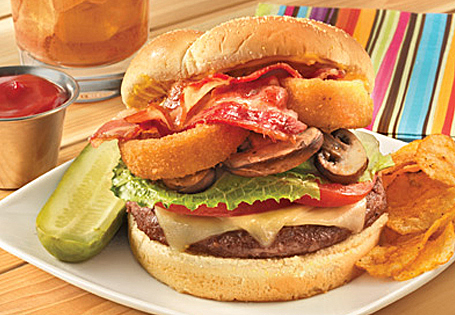 To assemble burger, layer the bottom of the bun with the patty with cheese, tomato, lettuce, sauteed mushrooms, 2 onion rings, 2 pieces of bacon and top half of bun.